In this month’s Paris Insights, we explore Julhès, a food emporium located on rue du Faubourg Saint-Denis in Paris’ 10th arrondissement. A family-run affair, it was founded in 1996 with 200 square meters of floor space, and has subsequently grown to four boutiques occupying 2000 square meters. 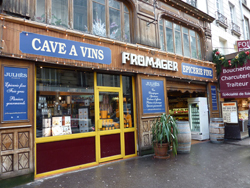 We had the occasion to interview proprietor Nicolas Julhès, who spoke enthusiastically about his dedication to supplying quality foods to his multiethnic clientele.